The Best and Final Edition. All 32 counties of Ireland and Northern Ireland (Ulster). There is no other like this one ! A magnificent world class illustration of Irish Family History, this book is the culmination of 4 decades of research by the I.G.F.. Hundreds of families from each county are given in Part One with family history. Over 45,000 family names are given in specific counties or Poor Law Unions. This is the new third edition (2003), which includes select family histories. For the first time ever, the index for the first 28 volumes in the Irish Families set is also included. The famous and large families like Murphy, Kelly, Sullivan, O'Brien, Ryan, Kennedy, Walsh, Daugherty and Donahue are of course in this book, as are thousands more, including rarely found families that settled in Ireland from England, Scotland, Wales, and the continent. Among the hundreds of settler names are those of Betagh; Coppinger; Trench; Coplan; Hall; Green; Hunter; McKenzie; Baker; Howell; Bellew and many more. Many English families have settled in Ireland from the 12th century onwards. Often, the native Irish were forced to "translate" their names into English sounding ones. The 50 most numerous names from England in 1853 are given, along with hundreds of family history extracts on specific families like Smith; Jones; Williams and Taylor. Due to the proximity of the north of Ireland and the south of Scotland, migration between the two countries has been constant. A great settlement of Scottish families took place in the 17th century during the plantation of Ulster by the British Crown. Later, some of these 'planter' families came to America, becoming known as the Scotch Irish or Scots Irish. The 50 most numerous names of Scotland are given, along with hundreds of family histories, including families like McDonald; Brown; Thomson and Robertson. Families came to Ireland in the 18th century from the Palatinate of the Rhine. In 1709 some 7,000 arrived in England and many settled in Co. Limerick, Ireland and America. Some of these are families like Bowen, Baker; Delmege and Pyper. The Danes (Lochlainders, Ostmen or Vikings), had colonies in Ireland for centuries. Centered in Dublin and Meath (in Fingall), and in Wexford, Waterford, Cork and Limerick, settling primarily in the coastal counties of Ireland from the 8th century on. These Viking families include: Betagh; Coppinger; Palmer; Plunket and Skiddy, among many others given in this work. Many Russian and Polish Jews settled on the south side of Dublin city from the late 1800's. These included the families of Coplan, Fridberg, Greenberg, Weiner, Maisell and many others given in this work. The Anglo Norman invasions of the 12th century brought many new families to Ireland. Some took on Irish names. Anglo Norman families in Ireland include: Barry; Bellew; Bermingham; Burke; Carew and Clare, among hundreds of others given in this book along with family history notes. French and Fleming Huguenot families settled in the 17th century in Dublin, Kilkenny, Waterford, Cork, and Lisburn, etc... They were noted for making linen, cloth and lace. Some of these families were those of Barre; Perrin; Hazard; Hassard; Lefanu; Trench and many others as given in this work. (1) When available, the coat of arms linked to the name appears above the name which is in bold type. All arms shown in this volume were actually used by families in Ireland, acknowledged by recognized authorities. (2) Beneath the name is the source from which the arms are taken. (3) Occasionally we list a Gaelic or more ancient form of the name on the next line in regular type. (note we have not punctuated these). We suggest those interested in the gaelic consult Irish Names and Surnames by the Rev. P. Woulfe. The IGF edition of that work contains a new surname index, which proves most helpful to researchers. (4) The next line, in italics, gives variant spellings of the name as available. The amount of information found will vary with each name. Please consult all possible spellings of the name. More information may appear in other volumes to this Irish Families set. Names not covered here will appear in other volumes of our Irish Families, great & small series. The surname index to this first volume , (and to volumes 2 through 28), is found in part III of this book. The researcher should consult that index as well as the location index found in part II of this book. The location index (see part II) represents extracts taken from larger, more detailed listings found in the Master Book of Irish Surnames. Space limitations do not allow reprinting all the index listings found in that book. In fact, there are over 50,000 listings from that book which we did not have room for at all! We have included as many surnames as possible to give hope to Irish family researchers. These listings may prove particularly helpful for those with less common names. The student of Irish family names would do well to consult that work independently. Including useful terms and abbreviations used. Showing territorial divisions upon the coming of the Vikings to Ireland. Includes Tirconnell; Tirowen; Uladh; Uriel; Brefney; Hy Fiachrach; Hy Many; West Meath; East Meath; Offelan; Fine Gall; Offaly; Omurethy; Leix; Ormond; Thomond; Desmond; Decies; and Hy Kinshelagh. Showing unconquered areas, and areas of Norman Rule & influence. Listing the major territorial divisions of Ireland, including: The Province; The County; The Barony; The Parish; The Townland; and Poor Law Unions. Showing railway routes in Ireland on the map. Key to Poor Law Unions and registrars dist. A Listing of the Unions along with registrars districts that they contained. Tips for the family researcher. Showing 325 baronies of Ireland on the map by county. The barony was used an a unit in 19th century land valuations. Showing families from other nations known to have settled in Ireland. Ireland upon coming of the Vikings. Showing the divisions of Thomond; Desmond; Decies; Ossory; Hy Kinshelagh; Ormond; Hy Many; Offaly; Leix; Omurethy; Offelan; Fine Gall; Brefney; Hy Fiachrach; Tirconnell; Tirowen; Uladh; and Uriel. This is the number one collection of Irish Families ever to appear in print. This Master volume alone, exceeds any other single book in the field. It is a one of a kind beauty - never equalled. There are more Irish Family names, spellings, locations, arms and sources here than in any other single book ever published. The Final Word This book contains information on families in all 32 counties of Ireland and Northern Ireland. Later volumes in this series focus on individual counties, and contain additional information, not found in this volume. New Third Edition. Available only with Thread sewn soft binding. 396 pages. maps, resource list for family research. Family Histories. 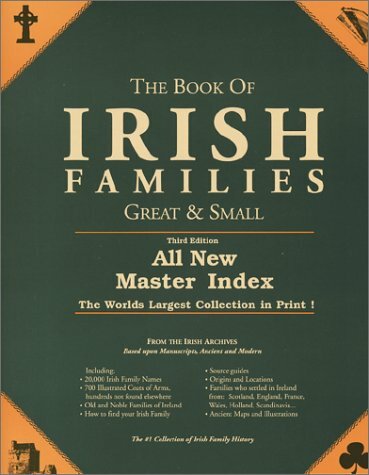 Additionally includes Master Index to the Irish Families series. Full 8 1/2 x 11 in size. If you have any questions about this product by Brand: Irish Genealogical Foundation, contact us by completing and submitting the form below. If you are looking for a specif part number, please include it with your message.